On Thursday 20th November something new hit the road in southern England: Britain’s very first 40 seat ‘bio-bus’ took to the streets of Bristol, serving the route from Bath to Bristol airport. The bus runs on biomethane gas created from Bristolians’ very own food waste and sewage. The waste is treated using anaerobic digestion at a local plant run by GENeco, which handles around 75m cubic metres of sewage and 35,000 tonnes of food waste every year from households and industry. The anaerobic digestion process involves the breaking down of biodegradable waste, such as food waste and sewage, by microorganisms in an oxygen-free environment creating biogas as a fuel. 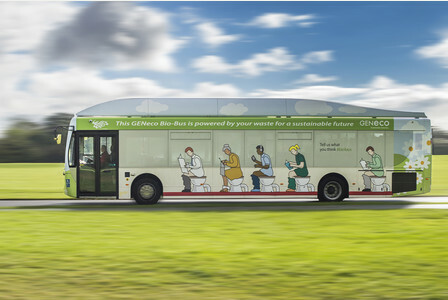 The fuel produced not only powers the ‘poo bus’ but excess energy is also pumped back into the grid, and is capable of powering 8,500 extra homes. This revolutionary new energy source is renewable, due to an almost unlimited amount of this resource, and produces fewer emissions than diesel engines, so could be the future of sustainable transport. Now anaerobic digestion has come to Birmingham, too! In November, Severn Trent Water announced their site at Minworth is using Birmingham’s sewage waste to supply over 4000 homes with biogas. The plant treats sewage from over 2.5m homes in the local area using anaerobic digestion. On the negative side, the Minworth site cannot utilise food waste, however this may in part be the council’s fault for not providing a food waste collection service in the region. The scheme has allowed Severn Trent Water to save over 1.7 million per annum on its own gas bill, which could potentially translate into a 5% (after inflation) drop in energy bills for the general public, which in the current climate of soaring energy prices is great news. Also, a proposed 300,000 tonnes of carbon will be saved as the energy displaces fossil fuels. It’s exciting that Birmingham is a part of this industry. Hopefully, we’ll see more anaerobic digestion plants in Birmingham and around the country, which will be a solid contribution to help in the fight for climate change!